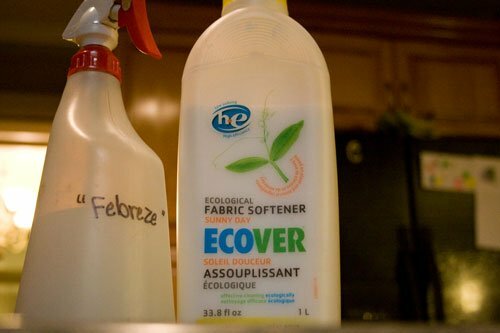 I love the concept of Febreze and other products that are intended to remove odors and freshen things up. 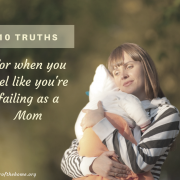 Goodness knows that our home has lots of places that can use just such a spray– the kitchen garbage can, the diaper pail, the downstairs bathroom, the minivan. When I began to switch over my household cleaning supplies to gentler versions that cleaned minus the toxic chemicals, I thought that my air-freshener days were over. Though it smells great, when you start researching the ingredients in products like Febreze (Benzisothiazolinone, Sodium Polyacrylate, Cyclodextrin, and synthetic fragrance, for example), you quickly discover that it’s not the sort of thing that you want floating through your home. 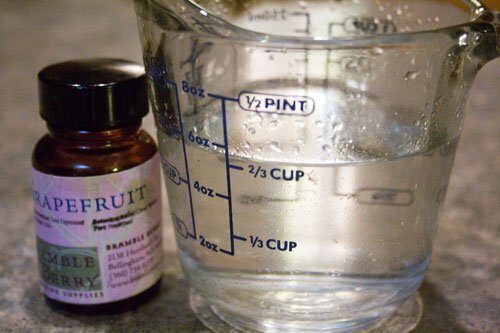 Sometime last year, I discovered these two simple recipes for making my own freshening sprays. They’re incredibly inexpensive, they smell pretty, they work on odors and they take so little time to make. You can double this depending on the size of your bottle. You can also make an even stronger version of this spray by using a higher ratio of vinegar to water and upping the essential oils (more like 20 drops) to use in a small diffuser bottle. This works better for just a quick spray into the air to freshen up a bathroom before guests, as opposed to the less concentrated spray that you would spray directly onto/into items. Fill rest of a regular size spray bottle with water. This one is my personal favorite, because it is just so fast and easy to make, and I happen to love the scent I’m currently using. What do you use to take away odors and keep things smelling fresh? I love the recipes. For years I’ve used just plain (cheapest I can find) white vinegar in the toilet bowl. I pour some in (about 1/2-1 cup), swish with a brush, and let it sit. It absorbs all the odors in the bathroom. During the potty training years for our boys, there were plenty of odors! A small dish of vinegar on the kitchen counter can also absorb lingering cooking odors. It can absorb the smell of fresh paint. Best of all, after a short time, the vinegar smell itself disappears. @Kathleen K, I didn’t realize that the vinegar could just pick up the odors by sitting in a bowl like that! Great ideas! I’d also seen some natural reed diffuser oil recipes that use water, essential oils and vodka (odorless and helps the oils travel up the reeds). However we currently live on a Christian college campus and we’re unable to have any alcohol on campus. When we move in the next year or two I’m going to try this recipe (and start making my own vanilla extract). I thought my air freshener days where over too! This will be great. Can you use it directly on fabrics too? @Rita, I do and haven’t had a problem, but I don’t spray it heavily. If you have a fabric you’re concerned about, I would probably spot test it in an inconspicuous place first. 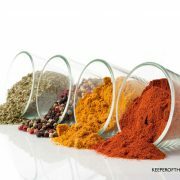 OK-quick question about the air freshener recipe: I like spicy scents in my home. Would pure cinnamon oil be OK to use in this recipe? I’m thinking burning eyes and such… Would it probably be diluted enough that it’d be safe? @Christy, I think the cinnamon oil would be fine, because it really is very diluted. Maybe just don’t make the stronger version that I mentioned. Great idea! Thanks. I use our Young Living essential oil diffuser when the house is smelling off (or I’m warding off airborne germs). But this is great for a specific application. Do you spray furniture directly with this? @Kim, Yes, I do, but as I said below I don’t spray it heavily on fabrics unless I know that the fabric can handle it. For any fabric that you’re concerned about, do a spot check in an inconspicuous place first. Other furniture (wood, metal, etc.) should be just fine. Where is the best place to purchase essential oils? Do any stores carry them, or do you have to buy online? I haven’t been able to find them anywhere. @Heather, I usually buy mine from health food stores/natural grocery stores, my health food co-op (Azure Standard) or from online supplement stores. Most naturally minded stores carry reputable brands of essential oils. I have rarely used air fresheners because of all the chemicals…but I wanted to. I’m excited to try this. When people are coking over I try to have some thing baking in the oven…then the house smells yummy! Norwex has a great odour eliminator. All natural, enzyme base and has a light sent of baby powder that dissipates. The enzymes eat proteins that cause bacteria and smell. HIghly concentrated so a little goes a long way! I am loving all of these cleaning recipes!!! 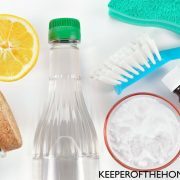 For years I have been using baking soda and vinegar for cleaning, but I am excited about trying to mix up the cleaners and soft-scrubber recipe. This air freshener is something my husband has struggled to let go. He really liked being able to spray a bathroom with a bottle of air freshener and have it immediately smell better. I think I am going to look for a couple of nicer looking spray bottles to keep handy in the bathrooms. Thank you so much! 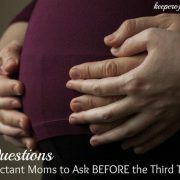 Where was this info last week when we had the baby-blow-out-of the century (up to his neck and down to his elbows!) and the dog we were watching pooped on the floor – both causing a major stink!?! I was going to leave a bowl of vinegar out, but I didn’t have anyplace to put it without the kids knocking it over. Thanks for the recipes! BTW – the bowl of vinegar works great for absorbing after-dinner odors. For example, I love the smell of cooking onions and garlic, but not when it lingers for days! I put a bowl on the stove top and it really helps! I was amazed when I first tried it! I’m so happy that you posted this! I’ve been looking for a replacement for the Febreeze we have, and I just happen to have a whole container of fabric softener that I never use on laundry! 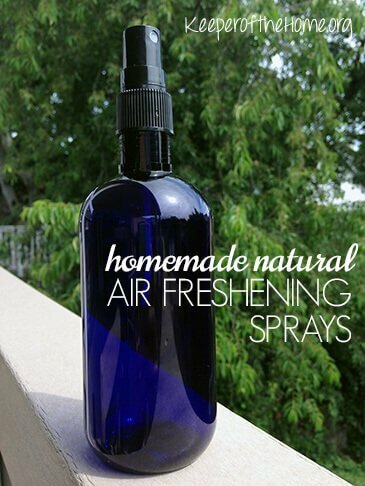 I’m always looking for new natural air freshener ideas, and I can’t wait to give these a try. On a trip to Maui, I purchased the most wonderful lavender spray. Once our family started to avoid toxic products, I read the ingredients… distilled water and lavender essential oil. Yes! I figured that’s simple enough to make myself. Now I fill a small spritzer bottle with distilled water, then add an essential oil to the desired strength when spritzed. It’s easy, and smells so good! I’m currently using a lavender and spearmint combination. @Jen, That’s another wonderful, simple idea, Jen! The only reason that you would want to add the white vinegar is because it helps to eliminate odors, while the essential oil adds the “pretty” smell factor. I’m sure that lavender and mint would be a good combo! I never thought of keeping a small, more concentrated bottle in the bathroom (on the back of the toilet for my house full of stinky boys!). I love it! One thing I wanted to add- is that it is way more fun to spritz the house when you add cute labels to your bottles (or left-overs, or home-made soap, etc..). I have been obsessed with labeling everything, and have a small drawer in my kitchen with different sized blank labels (from walmart), and pretty pens/markers. 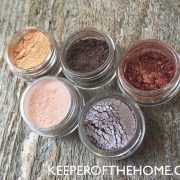 That way it takes me all of 1 minute to make up a cute label, and I like using my products so much more! ps- could you PLEASE find a recipe for home-made bubble bath? I have tried a few, and they have left my bathtub a gunky mess….. I make mine with 2c water, 1/4 c earth friendly fabric softener, and 1/8 c vinegar. @Jill, I have also never looked into natural, earth friendly fabric softener so I have no idea how it rates toxicity-wise. I was just surprised with fabric softener being one of the top 3 and wanted to pass that info along. @Jill, Absolutely. Regular fabric softener is not such a great product, at all, and if that’s all you have then I would recommend sticking with the vinegar and essential oils recipe. There are some natural ones out there with much, much better ingredients, fortunately. It is funny that you just posted this because I found this recipe somewhere else as a mirror cleaner and it works wonderfully as that but now it can do double duty! @Gretchen, Yes, it does work for mirrors! This is how I make my window/mirror spray, although I don’t always add the essential oils. btw, do you have a widget I can grab for my blog? @Rose, Hope you enjoy these recipes! You know, I don’t actually have right now, but I will have my designer make one for me. Thanks for reminding me of it! I know I am a little late in responding, but would this work well for just bathroom air freshener? I don’t want it to put a coating on surfaces with just a spray in the air. I have been using baby ganics but would love this idea if it would work! @Nikki, That is how I often use it. I haven’t found that it coats surfaces. Granted, I don’t use it daily, but I haven’t noticed any problems with it. this is also my concern: i spray the air freshener onto the air, then there are small droplets of liquid that land on the floor/surface. will adding vodka to the mixture make the liquid evaporate fast so it won’t have time to reach the floor/surface? regarding the vinegar, can we use plain white vinegar or does it have to be the distilled vinegar? distilled vinegars are more expensive than the plain white vinegars but then the latter’s smell is somewhat overpowering, and the scent of the plain white vinegar lingers. Perhaps leaving a bowl of vinegar in it overnight might help soak up the nasty smells?? Orange TKO, FL has Orange TKO and folks have been using it for over 14 years to organically eliminate any odor or stain; an all-around orange oil based liquid with all the oil distilled out of it. Usually available at FL dog, cat or horse shows in So. FL, (urine), but you can mention my email if you like and I can let people know how to get it if they’re at all interested; [email protected]. John…I have the answer for you! Put 3-4 drops of an essential oil in the toilet bowl water BEFORE going #2. I like eucalyptus. It absolutely instantly prevents the odor. This is my favorite Pinterest tip ever! I keep a medicine dropper of essential oil in each bathroom. Would this combination work? It consists of vinegar, baking soda and a few drops of vanilla extract. I don’t know the exact measurements but I’ll experiment. I haven’t tried it yet but I’ve read it works well. 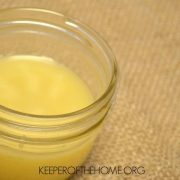 I want to use an inexpensive method so creating such a homemade odor eliminator seems ideal. I need to spray the mixture on a smelly battle dress uniform and a tactical vest I use for airsoft. Hi i’m trying to sort out the schools Bathrooms & i’m looking for a solution i can make up ( environmentally friendly & non-toxic ) and put in the automatic spry units at the Primary school toilets as their all gone green & got water-less urinals now that smell a little offensive. I’m repainting the toilets at the moment and have noticed the spray units are present & functional but all empty and i need some input as i believe maintenance is lacking & was after some nice odors for a water solution i could fill these bottles with & then get the children involved in making their own.